There’s something special about seeing an old barn in a rural landscape, something that suggests a simpler time, hard work, peace and quiet, family and farming. An Oklahoma history project has made an effort to preserve images of that era for the future. For the officials who were involved in the five-year project to document historic barns across the state, the reasons for doing so were mostly on the practical side. For the owners of the barns and similar structures that the Oklahoma Historical Society’s State Historic Preservation Office recorded in a partnership with Oklahoma State University, being counted had more to do with family pride. Chandice Lawhon of Newkirk owns one of the 966 barns included in the Oklahoma Landmarks Inventory database during the survey that ran from 2009 through 2014. Her barn, built by her late grandfather, Bennie L. Aupperle, in 1934, and used for his dairy farm, has also been listed on the National Register of Historic Places. She says that recognition goes a long way with her family. Though the property hasn’t operated as a dairy farm for years, the barn still holds much of the original equipment and several tools that Lawhon’s grandfather used. And, most importantly, she says, it holds plenty of memories. The historic survey of barns identified some beautiful structures like the ones shown here in every region of the state. The project sought to record at least 10 barns in each of the state’s 77 counties with architectural or historical significance. The State Historic Preservation Office maintains an extensive file of data on historic properties of all kinds. The survey on barns adds more depth to the state’s information on agricultural heritage. That systematic study has produced a database including photography of some of the most interesting, historic and visually aesthetic barns in the state. Brad Bays, of the Oklahoma State University Department of Geography, conducted the survey by examining the state’s regions. Counties were grouped by region and Bays surveyed anywhere from 11 to 19 each year from 2009 through 2013. Historic maps provided the data, which was evaluated using a Geographical Information System in conjunction with aerial photography and GPS technology. “My task was to survey barns over 50 years of age,” Bays says. “I produced a report on what exists and how the buildings are associated with historical changes in agricultural production and settlement. 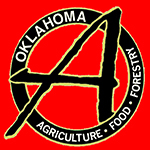 Oklahoma has thousands of barns that have yet to be surveyed, so efforts are ongoing. And Bays says they all have interesting stories.